25 Traditional Fiddle Tunes Newly Arranged for Bluegrass Guitar. Flatpicking guitar style delivers the clean, sharp solo sound that defined some of the greatest bluegrass recordings of the 1950s. 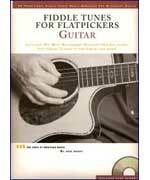 Now you can learn to play famous fiddle tunes specially arranged for guitar. Each song includes performance notes which give you helpful hints and tips on playing slides, double stops, fiddle shuffles, tremolos, ornaments, syncopations, and much more! The accompanying CD features specially mixed tracks that let you hear the guitar alone, the guitar with the backing track, or just the backing track to which you can play along to. So, get started flatpickin' now!